The Greater Phoenix Convention & Visitors Bureau, the nonprofit organization that markets metropolitan Phoenix as a visitor and meeting destination, has promoted Michael Mooney to the position of Executive Vice President. Mooney, who previously held the title of Chief Operating Officer, will continue to serve in that role. He joined the Greater Phoenix CVB in 1997. In the 16 years since, he has risen in rank and responsibility, from Director of Information Technology to Chief Financial Officer to his new position as the CVB’s No. 2 executive. 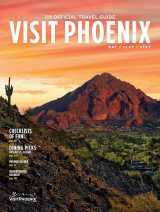 Prior to joining the Greater Phoenix CVB, Mooney served as the senior financial and technology officer for a private enterprise that operated in the tourism-related realms of aviation, hotel lodging, restaurants, ground transportation and golf in Arizona, Washington, Hawaii, California and Nevada. Immediately preceding that career path, Mooney developed computer software for the casino industry, specializing in timekeeping, slot accounting and guest tracking. Born in New Jersey, Mooney has called Phoenix home since his high school days. Mooney’s promotion follows two other recent reorganization moves at the Greater Phoenix CVB: Melissa Gogel was promoted to Vice President of Marketing, Communications and Tourism; and Scott Dunn was elevated to Senior Director of Marketing and Communications. Gogel, who has worked at the Greater Phoenix CVB since 2000, takes the supervisory reins of three departments: marketing (which is responsible for the CVB’s advertising, branding and website); communications (which coordinates media relations efforts); and tourism (which markets Phoenix to travel agencies and tour operators). A native of Nashville, Gogel had previously served as Director of Marketing. She began her career at the CVB as an assistant in the Membership Department. Prior to coming to Phoenix she worked as a marketing analyst for Harold’s clothing stores in Norman, Okla.
Dunn, also a native Tennessean, has worked at the Greater Phoenix CVB for six years, serving as Communication Manager and Associate Director of Communication. Before coming to Phoenix he spent 14 years in the journalism industry, working as a reporter and editor at newspapers in Utah, New Mexico and South Carolina.